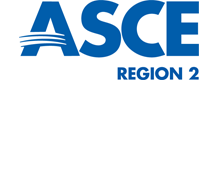 ASCE is working hard to develop opportunities and programs for the membership and this website will try to reflect what is happening at the Society level however the focus of the Region 2 website will be more towards the Region’s activities. The Society website is: www.ASCE.org, and if you have not visited, please visit that site for great information on ASCE in general. Please explore this Region 2 site for info at the Regional level. This is one of many conduits for information and services between the Society and you. Thank you for visiting our website and if you have comments or questions, please contact any of the Region 2 Governors. Thank you for being a member of ASCE!